Along with my husband, I’ve made a conscious effort to cut sugary sodas and other drinks out of my diet. Although we’ll occasionally drink Sprite or ginger ale, for the most part we stick with water and tea. Water is the best thing we can drink, and it’s fun to flavor it to help meet hydration goals. 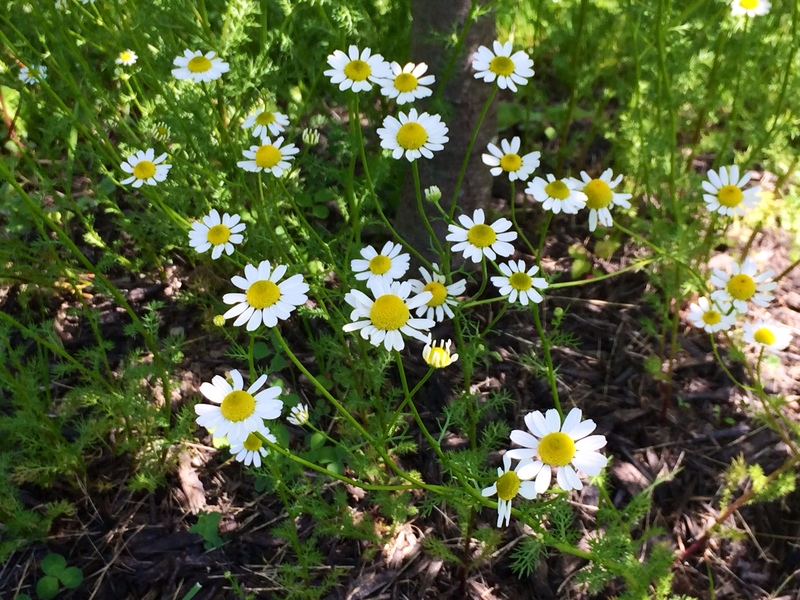 We grow herbs that can be used to brew fresh teas such as nettle, lemon balm, and chamomile, and a couple weeks ago discovered the chamomile flowers can be used to flavor water in a cold infusion. 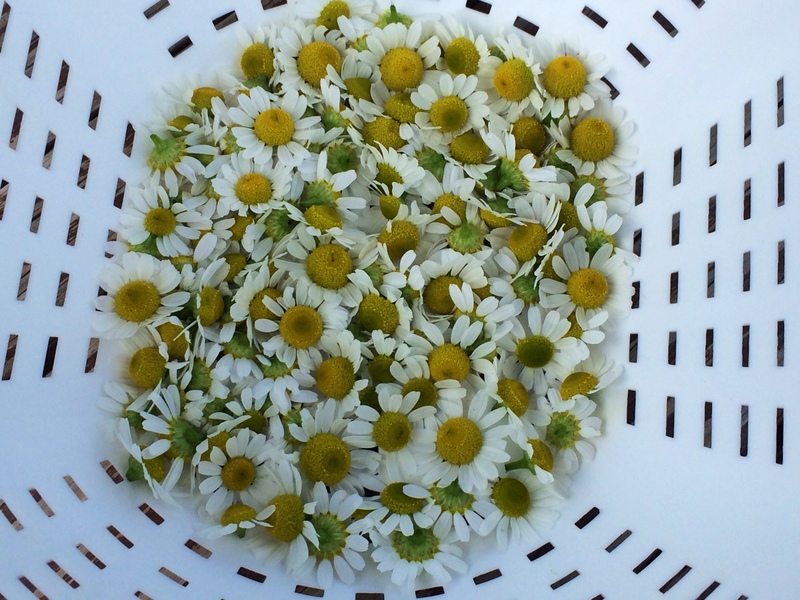 Chamomile is easy to grow (in fact, you want to plant it somewhere you don’t mind it spreading), and the cold infusion is a snap to make. 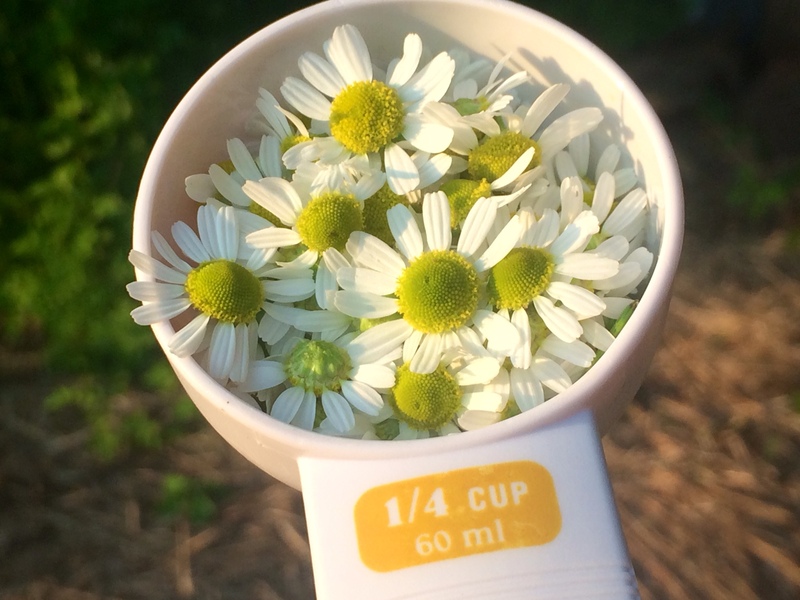 Clip about a 1/4 cup of the chamomile flower heads. Put them in a strainer and rinse. 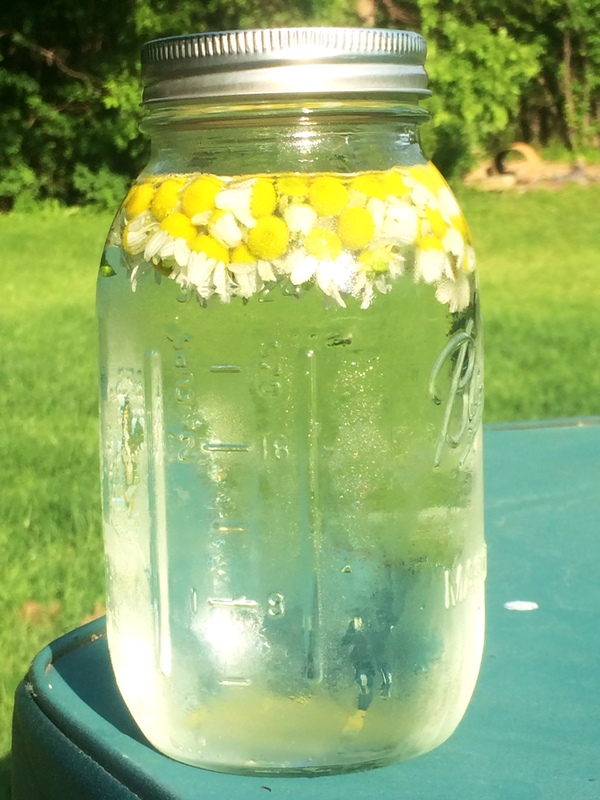 Pour the flowers into a 32 oz. mason jar. 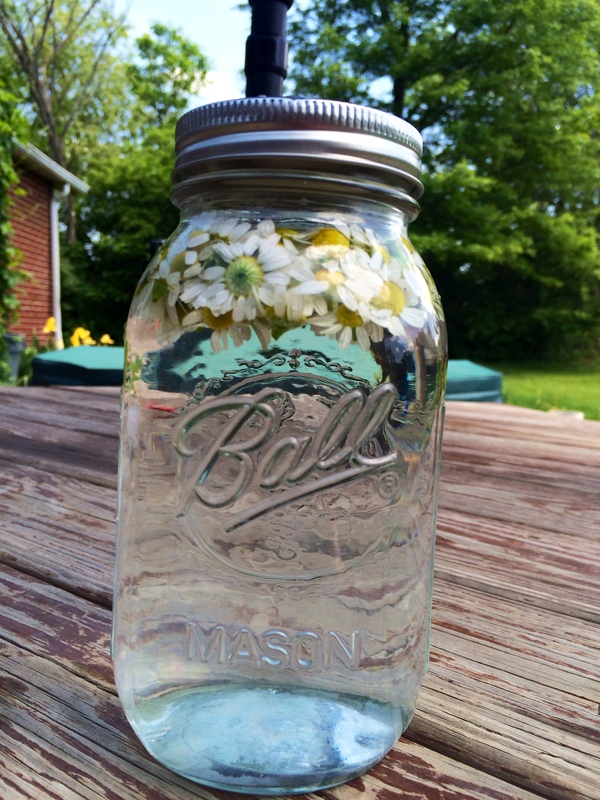 Fill the mason jar with water (preferable filtered), and cap. Place the mason jar in the refrigerator for 8-12 hours. Strain or scoop the flowers from the jar, and enjoy! The slightly sweet and delicate flavor of the water is so refreshing! 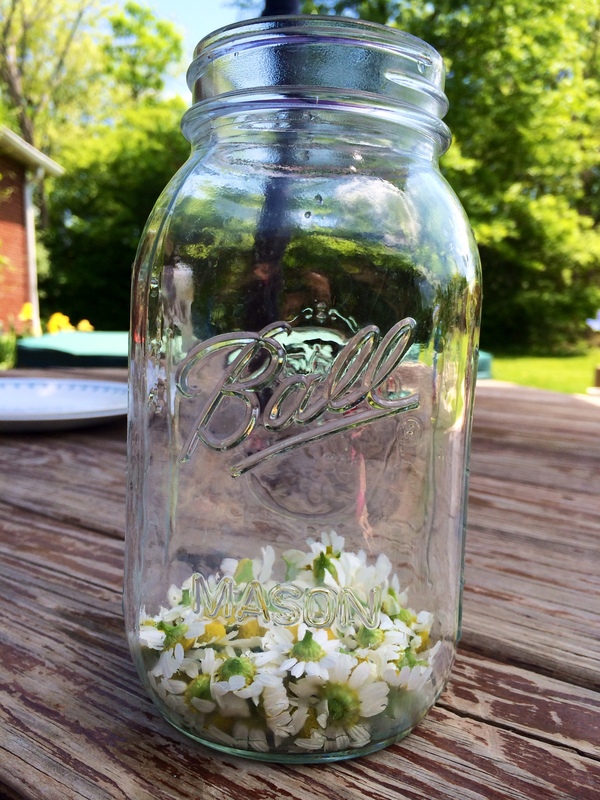 You can use the flowers you removed from the mason jar to make hot chamomile tea. Place the flowers in a saucepan, fill the pan with 32 oz. of water, and bring to a boil. The water will begin to change color, and it depends how strong you like your tea, as to when you want to turn off the burner. I then scoop out the flowers to add to our compost pile.